With cases spread across the country from coast to coast, Lyme disease is particularly prevalent in the Upper Midwest and the Northeast. As scientists discuss climate warming and the spread of mice that infect ticks, homeowners are left in the lurch wondering how to protect themselves and their families. A new study published in the Journal of Medical Entomology, from the Centers for Disease Control and Prevention and the New Jersey Monmouth County Mosquito Commission, offers support for a recently redesigned bait box that works as one part of an integrated pest management system. Bait boxes use a food attractant to lure small animals into a container. While other types of bait boxes use small animal poisons, these tick-focused boxes contain harmless bait along with the pesticide fipronil. The devices tested in this study were SELECT TCS boxes, manufactured by Tick Box Technology Corporation. The aim of the bait boxes is two-fold. By killing ticks that are infesting small animals, the lifecycle of the tick is interrupted, and there are ultimately fewer ticks seeking a blood meal from a human. 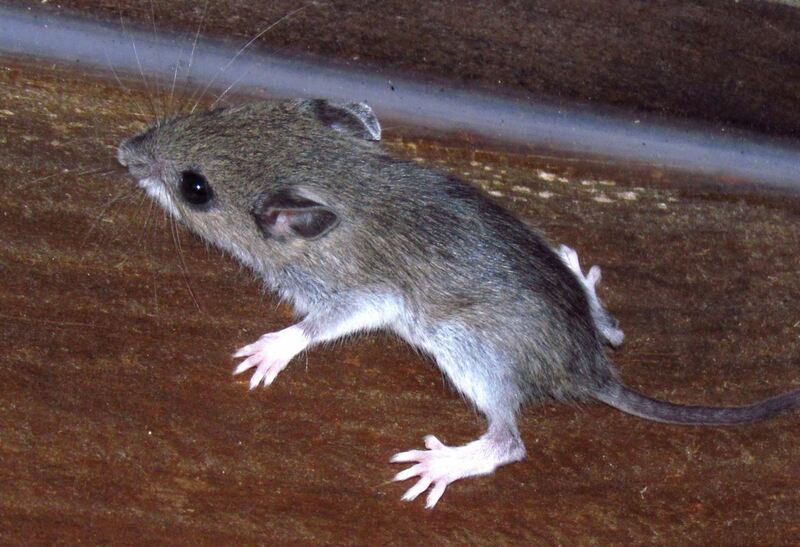 White-footed mice are themselves a reservoir host for several pathogens, including Borrelia burgdorferi, the bacteria that cause Lyme disease. As the bait boxes kill the ticks on the mice, the route of transmission of the bacteria to the ticks is also interrupted. The study notes bait boxes have been in use since 2002, but previous versions of the bait box, like Maxforce TMS, were prone to damage by squirrels that compromised the childproof safety of the boxes. The rights to the bait box were purchased from Maxforce by Tick Box Technology, which strengthened the box to withstand animal attack. Constructed from injected-mold plastic, the boxes are about 7.5 inches long by 5.5 inches wide by 2.5 inches tall. As small animals like mice, squirrels, and chipmunks enter and exit the box, they brush up against wicking material containing fipronil. The insecticide kills ticks on exposure, and is effective for approximately 42 days after application. To deter nuisance animals from stealing the bait, the boxes are constructed with tightly fitting galvanized steel and the cover and box are secured by cable ties. This study measured the effectiveness of the box, insecticide, and the impact of its use on local tick populations. For two years, between 2012 and 2013, 96 boxes were deployed on 12 residential properties close to wooded areas in Plumsted Township, Ocean County, New Jersey. The Assunpink Wildlife Management Area, in Millstone Township, acted as the control for the study. Between five and 14 boxes were set out per property in a concentric ring pattern, depending on the size of the habitat, and animal use was gauged by comparing weight of the boxes (the boxes were lighter weight after bait was consumed) and observation of droppings from mice, chipmunks, and other small animals. As part of the study, researchers also trapped and tagged small animals to record and compare the number of ticks found on small host animals. At each residence, 25 small animal traps were set, with 100 traps set in the Assunpink Wildlife Management Area. Trapped rodents were sedated, checked, tagged, and released where trapped. The bait boxes were accepted and used by target wildlife. With sturdy construction, about 14 bait boxes were disturbed during each annual study, but the disturbance did not interrupt the function of the box. After four nine-week deployments over two years, the number of Ixodes scapularis, called black-legged ticks or deer ticks, that carry the Lyme bacteria on captured host animals in the treated residential areas was reduced 97 percent. 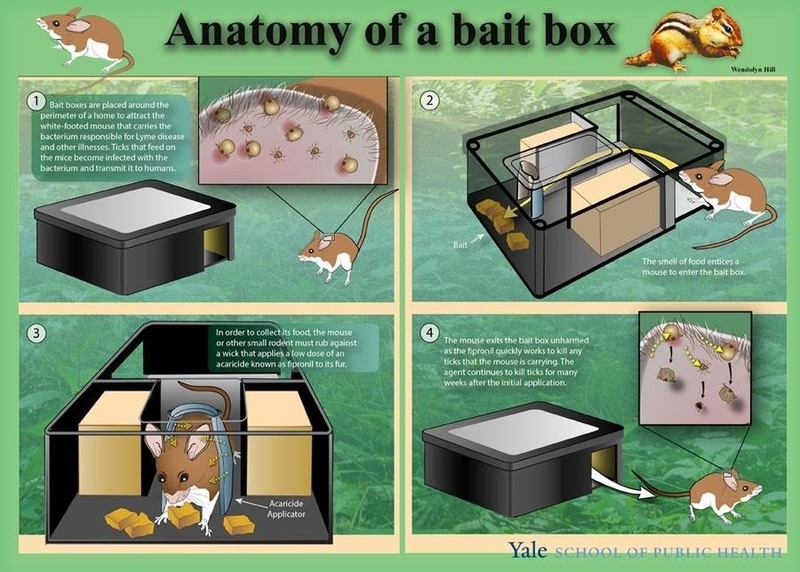 Authors noted the efficiency of the bait boxes depends on the use of adequate numbers of boxes to treat enough small animal hosts that live near, or are migrating through, the property. It is important to note the bait boxes target the larval and nymph stages of the tick, and kills only those who have latched onto a host. This means that declines in tick populations do not occur immediately, but have longer-term impact on reducing infestation on small animals, which later reduces the numbers of ticks available to bite humans. Ticks like wooded areas, stone walls, debris piles, and other locations where small animals are likely to live. When trapped or discovered, most deer ticks are usually found within nine feet of a greenbelt or forest edge. Ticks don't enjoy the sunny homogeneity of a manicured lawn, but can be found in brush, ground covers, and plantings. Landscaping, like deer-resistant ornamentals, that keep wildlife like deer away from your primary outdoor living spaces makes it harder for ticks to hitch a ride on you. Create a tick-free zone where you can enjoy the outdoors with less concern. Use wood mulch under plantings, remove weeds, put up fencing to keep deer out, clean up tumbled stone walls, remove dead branches, and clean up debris. Keep grass short and relatively dry if you have it. Exclude wildlife from your property, including bird feeders that attract rodents and squirrels. If you use insecticide sprays on your property, be aware you are killing more than ticks, since most pesticides do not discriminate for insect types. Use according to direction and be sure to wear protective clothing as directed. For homeowners willing to stay the course with bait boxes, proper use of the devices can impact the number of infested animals, and maybe reduce the chances you, or a family member, are exposed to Lyme disease. No matter what type of pest infestation it is, their infestation can result in a dangerous infection to both people and the environment too. One should take into account different preventative measures like taking help from experts like Connecticut tick control team or else can use the organic pest spraying by themselves. By going ahead this way, one can easily make sure that they are living in a much healthy environment.